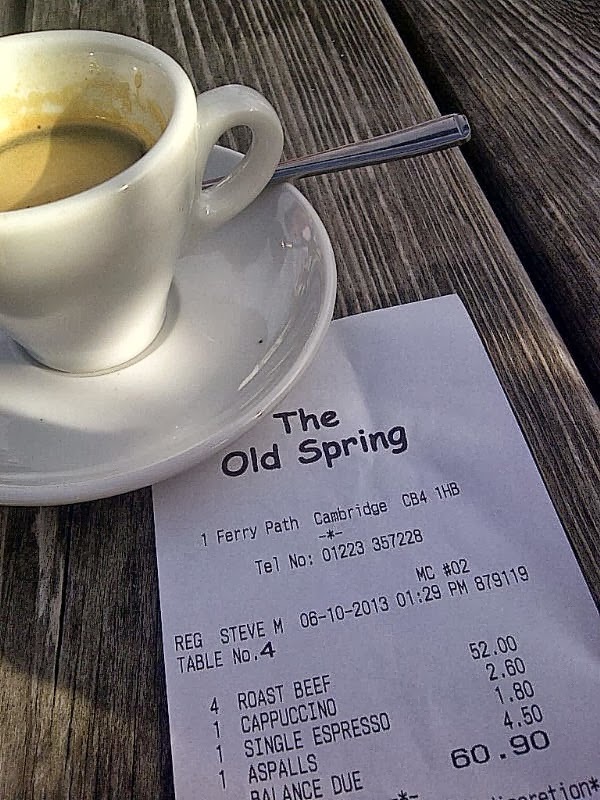 For such a busy lunch service, we were surprised to find only two roast meats on offer: beef and pork, both £13.00. 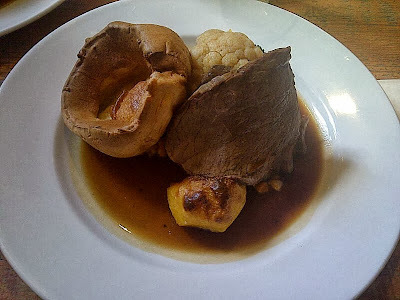 By 1.30pm, the roast pork had sold out so the decision was out of our hands and we went for roast beef all round. Service was friendly and efficient, despite the crowds at the bar. 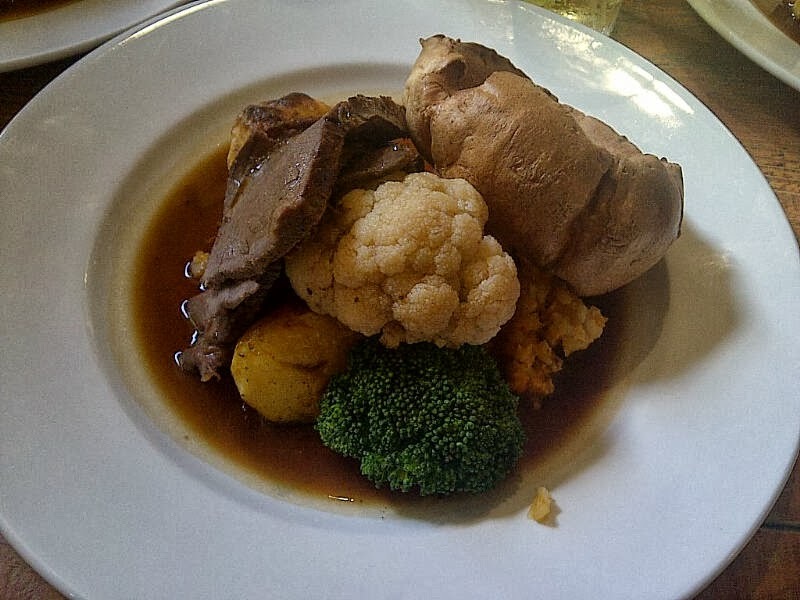 The food arrived relatively quickly, each roast arranged into a central stack on the plate, swimming in gravy and topped with a large Yorkshire pudding. We felt uneasy at first glance; thick slices of well-done, rather dry looking beef were the plate's main feature, with a tired chunk of hard cauliflower peeking out from beneath. Hearts sinking, we wondered how this could possibly end well. Overall, it wasn't a total write-off; there were some good points. The choice of vegetables was pleasing, including a particularly generous portion of roughly mashed swede and carrot which was fairly well flavoured and not over-buttered, but rendered irrelevant by the almost raw and tasteless broccoli and cauliflower accompanying it. Good gravy was the plate's saving grace: rich, meaty, well-seasoned and a touch buttery, with a consistency that was just right. Sadly, we suspected this didn't work in the chef's favour as it highlighted how little taste could be found on the rest of the plate. The homemade Yorkshire puds were not too bad either, if a little burnt on top and quite dramatically inconsistent so that one of our party's pudding was entirely flat and less than half the size of the others. Soaked in gravy the overcooking couldn't be spotted and, otherwise, the texture of the Yorkshires was good. Trimmings were limited to the usual horseradish sauce and our requested Dijon mustard - both clearly from jars and decidedly average. Leaving the worst 'til last (and leave it we did), we were disappointed to find the most important elements of the Sunday roast severely overlooked. There was nothing good about the lacklustre slices of over-cooked, tough old beef and they tasted as dull and displeasing as they looked. Perhaps it had been edible at some point earlier that day but, by the time we were tucking in, the leathery meat was a real chore to get a knife through (let alone our teeth). Something was amiss with the roast potatoes too; glistening with butter they might have been, but the golden skin had no crisp to it and the potato inside was hard and dissatisfying - summing up rather well how we felt after eating the meal. The verdict: A dull and disappointing Sunday roast with a baffling lack of good quality ingredients and taste at a ridiculously inflated price (particularly considering that last week we enjoyed an exquisite roast lamb lunch at St John's Chop House for less). The score: 1.6/5 (1 on the scale being absolutely terrible and 5 equalling roast lunch perfection). Price: About £30 for 2 people excluding service.